Strawberry Swing and other things: PSA! 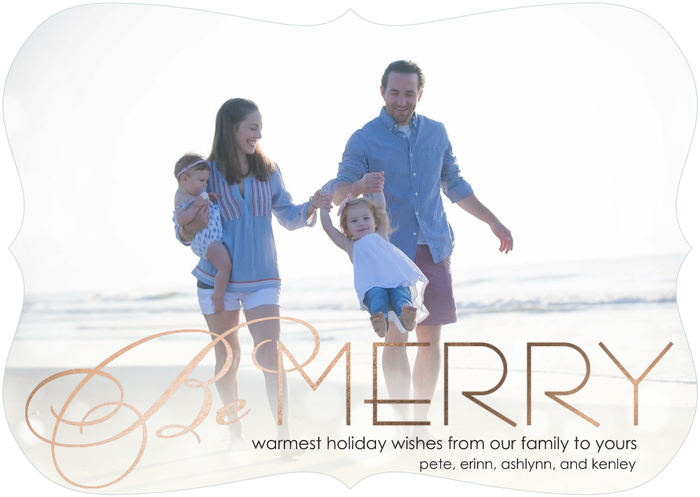 Tiny Prints Holiday Card Super Discount! If you are like me, you get all your "to-do's" done after the kids go to bed. I was actually on top of my S this year and already ordered my holiday cards - and dropped them in the mail yesterday! I'll share our actual card later this week after some of our friends and family have received them, but the above was one of my runners up. So many cute choices and lots of gorgeous foil-stamping in a variety of colors other than gold. However, I think I might just stay up late or set my alarm so I can take advantage of this deal to order some more, I always underestimate the amount I need. Hence why I'm asking for a new address book for the holidays! From 10pm to midnight Pacific time tonight (that's 1am to 3am ET), Tiny Prints is sweetening their already sweet Cyber Week deal. Any other time of day, today or tomorrow, you can get 40% off all holiday cards using the code CYBER40. So, if you're not a night owl, use that and throw on the code FREESHIP49 for free shipping if your order is more than $49. But, if you are up late tonight, add the code FLASH1202 and you'll save an extra 10% on your order. That's a total of nearly 50% off holiday cards. So check it out and remember to use all 3 codes to save nearly 50%!